Is your furnace acting up? Do not panic! Since your furnace stayed off for a few months, it might be having mechanical and operational difficulties which our specialists at All Weather Temperature Control Inc., can help you understand. Below are the top furnace problems that Copiague, NY homeowners commonly experience. The advent of winter requires your furnace to work reliably throughout the season. But what would you do if your system does not give off warm air? If this is the case, do not ever think of doing repairs yourself. Call us right away so we can diagnose the problem and provide quick and quality solutions. Have you tried several times turning on your furnace but failed? 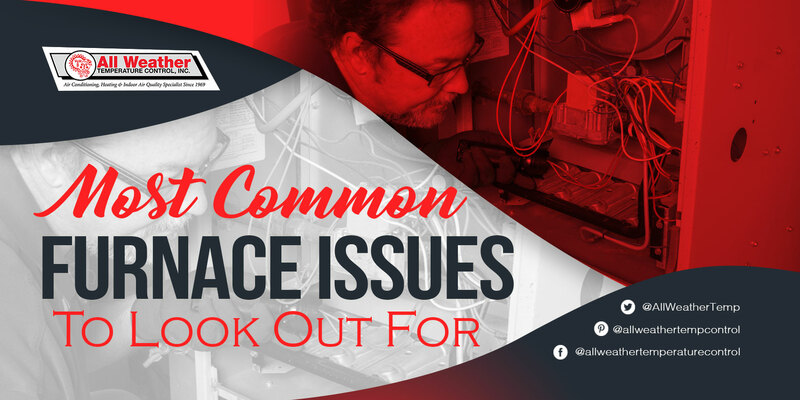 This cold season, you are likely to encounter this issue especially if your system is not maintained properly. There are a few factors that cause this problem with your furnace such as electrical issues, age and wrong thermostat setting. Talk to our experts to identify the root of the issue. With a cracked heat exchanger, the heated air will not reach all areas of the house as it is required. A broken heat exchanger should be repaired or replaced immediately to keep your family safe from carbon monoxide and other harmful gases. Kindly contact us if you suspect holes, cracks and other similar problems on your heat exchanger. Some furnace problems root from the blower motor. This is why you would notice some unfamiliar noises like hissing, squeaking and clicking sound. These are minor blower issues caused by an impaired blower or worn out blower belt. Any issue concerning your furnace’s blower is not your typical DIY task. Always find time to consult the problem with your trusted heating contractor for safety purposes. If there are hot and cold spots in your home while your furnace is running, something is wrong with your system. Uneven heating is a result of restricted or poor airflow. When heated air is not evenly distributed to all areas of the house, it signals problems in the ductwork and insulation. A furnace issue like this calls for professional help and assistance, so do not hesitate to give us a call. Are you experiencing any of the furnace issues mentioned above? Let us help you fix these issues one by one. Feel free to call our furnace experts at All Weather Temperature Control, Inc. Rest assured that we have the solutions to all your heating needs. Do Humidifiers Really Help Asthma?